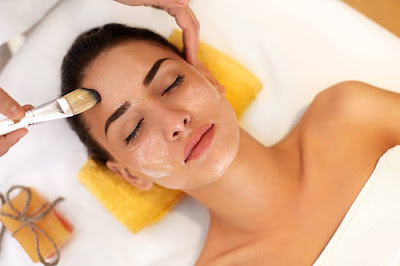 Who doesn’t like natural, glowing, fair and beautiful skin, Of course it's a dream of everyone specially women’s main concern is to look attractive and fair with a glowing skin. We have various handy fairness creams, powders and lotions to get shiny, glow skin but those are not safe and only work for a short period of time. Essential oils of Jasmine flowers contain antibacterial, antiseptic and antiviral properties which treats dry and dehydrated skin by providing natural moisture. Grind some fresh jasmine flowers with 1 tablespoon sugar and 2 table spoons of yogurt. Mix all of them very well and apply the paste on your face. Wait for 15 minutes or until it gets dry then wash your face with cold water and pat dry. This face pack will lighten up your skin color and also give a new shine to your face. Lemon works as natural skin lightening and evens out the skin tone. Sugar helps in get rid of dead skin cells and cleanses pores. Combine 2 tablespoons of sugar with 2 tablespoons of lemon juice and mix well. Apply this juice evenly on your face using a cotton ball. Let it stay for 20 minutes and clean with Luke-warm water. You can use lemon and sugar scrub on both the face and body but be gentle when you use this scrub. Orange juice also helps with lighten your skin tone just like lemon juice. Oranges contains potassium, Folic acid and Vitamin C, which improves elasticity of skin. Orange Juice face pack is good for oily and acne prone skin. Add 2 tbsp. of orange juice with 2 tbsp. of yogurt and 1 tbsp of honey then prepare a paste. Apply this pack on your face and wait for 15 minutes then wash it off using lukewarm water. Mangoes are loaded with powerful phytochemicals and antioxidants that nourishes your skin. Mango pulp can remove dead skin cells and ensure your skin remains healthy and glowing. Take 1 tablespoon mango pulp, 1 teaspoon honey and 1 teaspoon yogurt in a bowl, combine all these ingredients using clean fingertips and make a fine paste. Spread the mango face pack all over your face in a circular motion. Let it stay for 10 to 15 minutes or until it dries up completely. Now wash your face with warm water to remove the pack then pat dry using a soft towel. Oatmeal contains saponins, which helps with acne and also removes dirt from pores. By exfoliating the dead cells in skin oats gives you a clear and spotless skin. Add 2 tbsp of grounded oatmeal to 2 tbsp of yogurt and few drops of honey to make a fine paste. Spread this oat meal face pack all your face and wait for 20 min to dry. Rinse your face with cold water.